If you’re in the market to sell your home, many people often ponder the return on investment where the resale value is concerned with landscaping. Likely, you’re involved in some home improvement projects within your home, and the outside curb appeal may be overlooked. Don’t neglect the outside aesthetics so fast! Think about a first date. If your date arrived to a completely disheveled and unkempt person, would they ask you out again? Or, would they just drive away?! Curb appeal matters — looks matter! So, read this blog and address your needs with our landscape services and information. 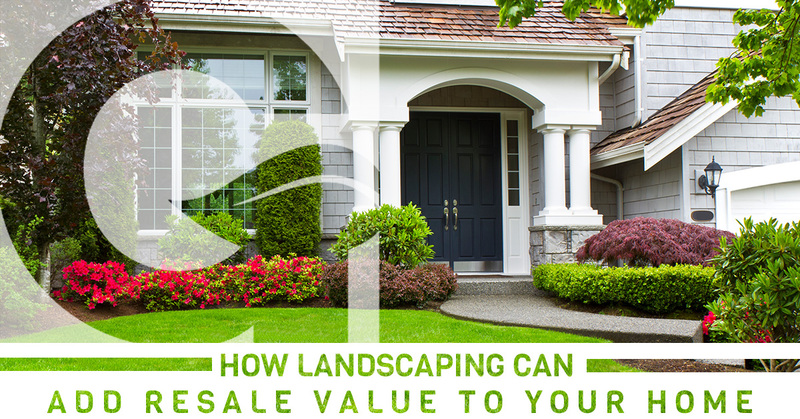 What is the resale value in landscaping? It’s been pounded into anyone’s head who watches home improvement shows — ahem HGTV — that there is an extreme value in curb appeal. Most home buyers get giddy about the aesthetics as they drive up to tour your home, hence the first date scenario. A home that is for sale is more likely to attract potential buyers with an aesthetically pleasing and inviting outside. The more people who are interested, the more will walk through an open house, and the more offers you may receive. Although that’s not quantifiable in a dollar amount, the concept trends upwards and increases your chances of selling your home — so don’t skip out on landscaping services! If you want to increase the resale value of your home through the landscaping avenue, it is suggested that you invest at least 10 percent of the value of your home. There are stories of people who invest $20,000 and sellers have received $200,000 over what they had paid for the home the year before! There is no hard guarantee on your home’s return on investment in landscaping, but most real estate experts will say it greatly improves your odds. What kind of landscaping should I implement? With the larger investments you can always perk up buyer’s ears by stating your yard has energy efficient landscaping — after all, the trees help shade your house which keeps it cooler in the summer and the large yard boulders reduce water consumption! What if I can’t make a big investment on landscaping? Add vibrant-colored flowers – Draw prospective home buyers in with color. Include both annuals, perennials, and flowering shrubs. Do basic lawn maintenance – Have a landscaping company trim branches on trees, mulch, edge, and remove weeds. Make sure your lawn is nice, green, and as full as possible. Here at Green Garden, we’re here to help you with all of your landscaping projects from landscape design and implementation to lawn care maintenance. Always hire a professional landscape company to get the job done right. You may first want to consult with a ASLA (American Society Of Landscape Architects)-certified architect. These professionals are well versed in botany and horticulture. They can tailor your space with local botany and can assist you with what grows best in the soil and your region. If you’re ready to put some pep in your curb appeal and increase your home’s resale value with landscaping, contact us today! We’re happy to schedule an appointment for an estimate! Call today!